Do you love mochi? We knew you would. Although our mochi ice cream never gets old, here are few ways to spice up your dessert using our favorite, sticky dough. Ok ok, this is still mochi ice cream, but with a twist. Rather than covering scoops of ice cream in mochi, take small chunks of mochi and freeze them within your popsicle! 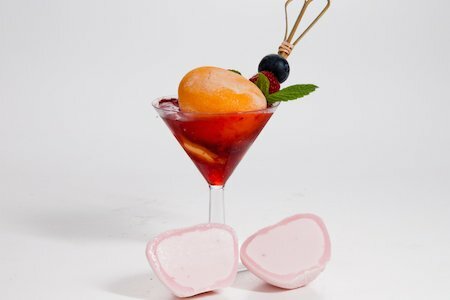 You can make your own mochi, or purchase packs of mochi bites from your local grocery store and make this dessert at home. All you’ll need to do is pour in your favorite popsicle flavor into the mold, plop in a few mochi bites, and place your creation in the freezer. For the best results, freeze this overnight. In just a day, you can have mochi filled pops for the whole summer! Who doesn’t love a fresh donut? We certainly do. To put a spin on your homemade donuts, use mochi dough! To transform these simple ingredients into scrumptious donuts, start by mixing 1/4 cup of sticky rice flour and 2 tablespoons of whole milk. Pop this mixture into the microwave for about a minute until you get a dough like texture. While your dough is cooling, mix together another 1 ¾ cup of sticky rice flour, ½ cup of milk, butter, sugar, baking powder, and your egg. After your dough has cooled, blend these two, sticky mixtures together and lay it flat. Cut your donut circles, plop them in a pot of hot oil, and—voila—you’ve got mochi donuts! Mochi covered strawberries, known as Strawberry Daifuku in Japan, is a traditional summertime treat. The traditional recipe calls for mochi and red bean paste, but we’re providing you with an alternative—chocolate. To start, let’s prep our mochi dough. By simply mixing sticky rice flour and sugar with three parts water, you’ll have your rich, mochi dough. Pop your dough in the microwave for a minute, and stir at the 30 second mark. Microwave your creation in 30 second to one minute intervals until it starts to resemble dough. While your dough is cooling, wash and remove the stems of your strawberries. Here’s where the options come in. Now, you can choose to cover your strawberries in red bean paste, dip them in chocolate, or leave them plain. No choice is a bad one. Layout and sprinkle baking powder over your dough and cut into small pieces. Pick up your strawberry and begin wrapping the dough around it. Once your strawberry is completely wrapped in mochi dough, you’re ready to enjoy! We recommend popping these guys in the fridge for a hour or so to make them the perfect, cool treat for the summer.